Shopping for new or used Chevy SUV models should not be a hard challenge at your local Chevy dealers in Wisconsin. And it won’t be when you come to Ewald Chevrolet Buick in Oconomowoc WI. At Ewald’s Chevy dealership, we want to make it easy to find and buy the right Chevy SUV for sale near me to meet your needs. We even aim to make it even to enjoy your SUV buying experience here at Ewald Chevrolet Buick. When it comes to searching for a Chevy dealer and researching Chevy SUV models, come to Ewald Chevrolet Buick. Here at Ewald’s Chevy dealer find the perfect Chevy SUV models. Ewald Chevrolet Buick offers competitive finance offers and Chevy lease deals available through GM Financial. Like a Chevrolet Tahoe lease. Chevy lease deals through GM Financial are ideal for anyone looking for a new SUV with a lower payment. And the Chevy Tahoe lease is sure to capture your eye and your heart as well. The new 2018 Chevrolet Tahoe Premier is sure to do just that. With this new Chevy Tahoe lease, you can experience Chevy lease deals through GM Financial at Ewald Chevrolet Buick. The Chevy Tahoe offers great power, ideal interior space, and high towing capability. There is also an abundance of great features and options that you can enjoy on this new Chevrolet Tahoe lease. Such as a lane keeping assist system, multi-zone climate control, built-in navigation, and more! Such as memory mirrors and driver seat, a hands-free liftgate, and cross traffic alerts. Come and discover all that is new Chevy Tahoe lease can offer you. 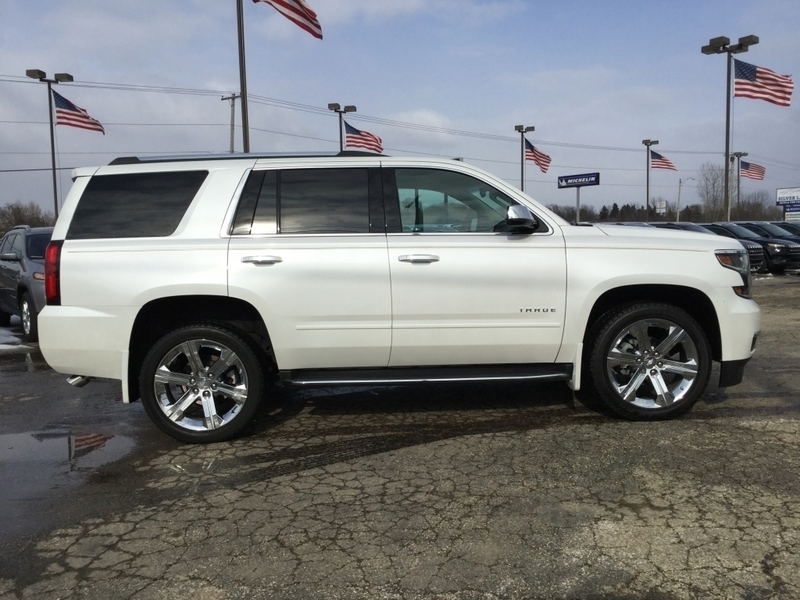 It is worth your time to stop in today and give this Chevy Tahoe a test drive down the streets of Oconomowoc WI. So come on over to Ewald’s Chevrolet Buick today and check out this new Chevy Tahoe lease today! We encourage our Ewald shoppers to take full advantage of our online shopping tools. You can browse our Chevy lease deals available through GM Financial, check out our vast inventory selection of new Chevy SUV models, and more. Give our knowledgeable and friendly team a call when you're ready to take a new Chevy Tahoe or other Chevy SUV model for sale and lease out for a test drive! When it comes to Chevy SUV models for sale and Chevy lease deals, make the trip here to Ewald's Chevrolet Buick dealership today. We are happy to sit down with you and discuss with you what your everyday needs and desires are as well as payments for your GM Financial deal for your next SUV. We look forward to working with you at Ewald. We want to help you find the right Chevrolet SUV model and Chevy lease deal for you. You can give us a call by dialing (262) 226-2842 to schedule your test drive. Or, you can check us out in person at Ewald Chevrolet Buick located at 36833 E Wisconsin Ave Oconomowoc WI, 53066.